What is the history of the former American Legion currently being remodeled on Government Street? 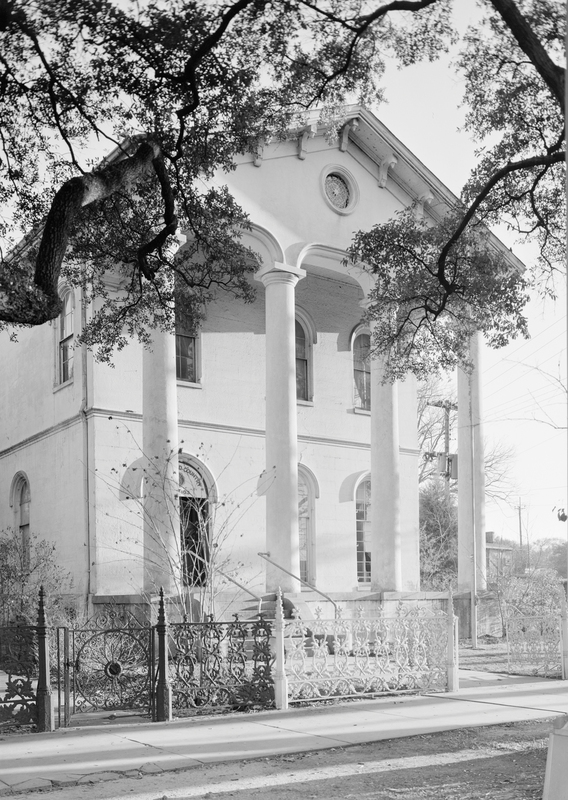 Photo Courtesy Library of Congress, Prints & Photographs Division, Historic American Buildings Survey AL-800. The house under renovation on the southeast corner of Government and Dearborn streets was constructed in 1857 by Joshua and Mary Emanuel Kennedy. The couple had married in the spring of 1853, uniting two of the wealthiest families in the state. The bride’s father was Jonathan Emanuel, a British-born merchant and insurance executive. Joshua’s father, an 1803 graduate of Yale’s law school, came to Mobile around the time Alabama became a state and prospered in real estate. He was reportedly the richest man in the state at his death in 1838. Joshua was a graduate of Williams College in Massachusetts and went into the wholesale grocery business upon his return to Mobile. At the age of just 27, he began construction on the impressive mansion, which still stands at 607 Government St. The fun did not last long. The Civil War erupted, and Kennedy left Mobile for the Confederate army, where he soon had the rank of First Lieutenant. On June 1, 1862, Kennedy was shot during a battle near Richmond, Virginia. He was one of nearly 1,000 casualties that day and was only 33 years old. No doubt because of his status, his body was sent by train to be buried in Mobile. In some sort of terrible mix-up, the casket was not unloaded and continued to the end of the train line in Texas. Joshua Kennedy, once one of Mobile’s wealthiest and brightest young citizens, rests under a simple military marker in a cemetery located between Austin and San Antonio. Mary and her daughter continued to live at 607 Government St. as the war dragged on and finally ended. In 1872, Isabella, then 21, attended a house party in Citronelle and fatally ingested a poison she mistook for a cure for a sore throat. It was an agonizing death and may well have led to her mother’s decision to have a change of scene. In 1872, Mary and her sister, Virginia Mitchell, traded houses. Mary thus returned to her childhood home at 251 Government St., which would survive until its demolition in 1939 to provide a site for the new Admiral Semmes Hotel. Mitchell’s son sold the house after her death in 1919. It was converted to the Seamen’s Bethel, a local organization dating to 1845, charged with looking after the physical and spiritual welfare of local seamen. The Bethel had disbanded by World War II, and in 1947, it became a post of the American Legion, an organization bursting with returning servicemen. It was during the ownership of the American Legion that the home’s service wing to the south was replaced by a large meeting hall. In recent decades the membership dwindled, and the declining structure was on the verge of demolition when a nonprofit organization, set up by members of a local Mardi Gras organization, bought it. The restoration of this once derelict structure is nothing short of a miracle.